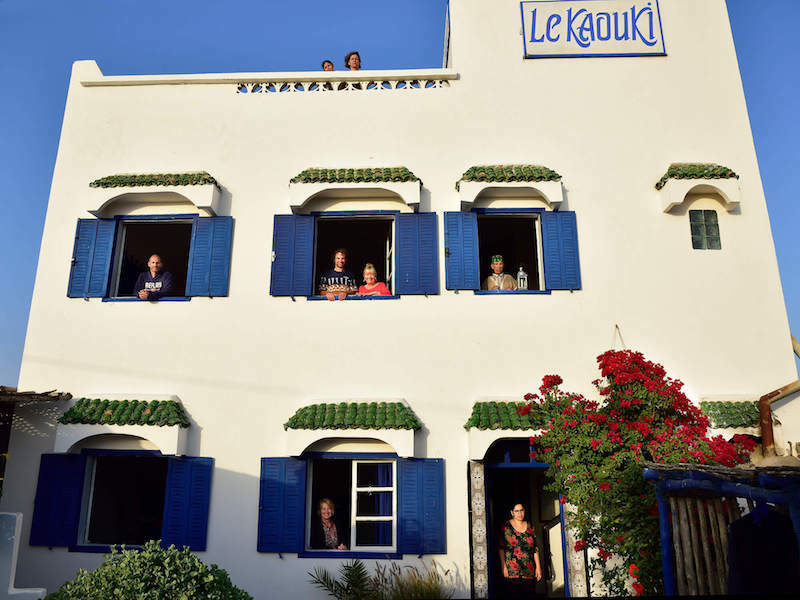 Welcome in our Residence Le Kaouki next door to Essaouira on the Moroccan Atlantic coast. We are a family-friendly hotel, which you can also book for family-meetings, weddings or various other events. Please contact us for a special offer! ‘Residence le Kaouki’ is a delightful hotel located on the beach of Sidi Kaouki 15 miles south of Essaouira on the route to Agadir. Stay with us and appreciate authentic Morocco; we can help you discover the numerous treasures of Morocco at your own pace. In the restaurant, Khadija will serve you typical Moroccan cuisine, prepared with seasonal produce: delicious ‘tajines’, ‘couscous’, grilled fish. The meals are served in our restaurant with a fireplace where you can dine by candlelight in a cosy warm atmosphere. There are different ways to explore the beaches of Sidi Kaouki. We’d love to provide you with a delicious picnic and organize you a professional guide with local knowledge. There are kite and surf schools in Sidi Kaouki and different options to rent surf equipment. We are working together with professional surf guides and inform you about your various options. There are cheap sun lounger and beach umbrellas for rent at the beach. A ride on a dromedary over the beach is one of the most impressive adventures in the region of Sidi Kaouki. Dromedaries are gentle and good-natured animals who live in harmony with the Berbers around. Sidi Kaouki is an ideal starting point for riding trip at the sea or in the argon-woods nearby. 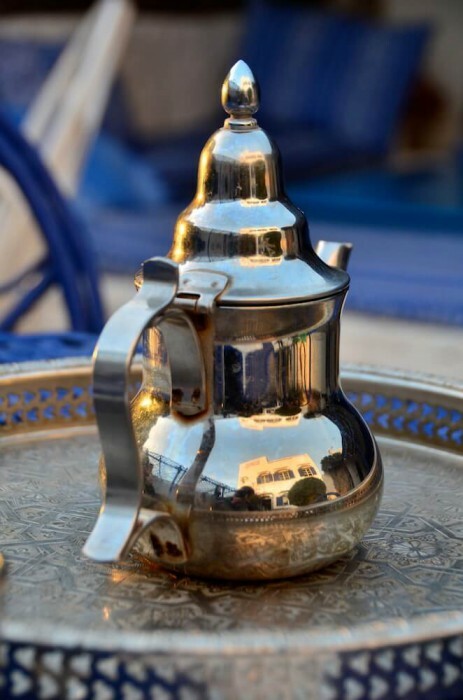 If you are offered to take part at a traditional “Thé à la menthe” from a Berber family you are welcomed to accept this invitation. If the dromedaries are too big and impressive for the little ones, we are pleased to organize a trip on the back of a donkey for them. The extremely beautiful 18 hole golf course of Essaouira-Diabat is just a few kilometers away from out hotel. You’ll reach it within 20 min by car or taxi. We’re pleased to organize you a trip to a traditional and trim Hammam in Essaouira. In our hotel we offer you massages with luxurious argan-oil from the region. All over the region of Sidi Kaouki you’ll find the precious and shade-giving argan-trees. The oil, which is extracted from the fruits, is a delicacy and of course we also use it in our hotel kitchen for the preparation of our traditional moroccan dishes. A visit in one of the argon-cooperatives is recommendable and we’re pleased to organize a trip for you. All of your guests love our kitchen and are welcomed to cook with Khadija or Rabia their most delicious meal. Seasoned Tajines, Berber-omeletts, sweets… Everything tasty. Our youngest chef was only 8 years old! A visit of Essaouira is a must during your visit at our hotel. Essaouira is a beautiful port city with oriental flair and an authentic port and lovely small cafés. There are great opportunities for shopping for silver jewelry, spices, scarves and linen, marquetry, leather products and much more. Ask us and we’ll provide you with special shopping tips! At Le Kaouki we love to laugh, dance and celebrate. We have a huge experience in organizing and arranging parties. Birthday-Parties, meeting with friends, music evenings and even a wedding were organized from us. Ask us for special rates and offers! You are just one click away from paradise! Sidi Kaouki is a small Berber village on the Moroccan Atlantic coast 15 miles south of Essaouira on the route to Agadir that is the antic route to the desert. Between Marrakech and Agadir, Sidi Kaouki is ideally located to visit the fascinating wide Moroccan south. The bus n°2 drives you from Essaouira to Sidi Kaouki and return (9 shuttle a day): we recommend you this exotic disorientation! 2 domestic flights connect Essaouira to Casablanca.